Our universe is composed mostly of matter particles such as protons, neutrons (that make up nucleus), and electrons rather than their antimatter partners: antiprotons, antineutrons, and positrons. This is in contrast with the prediction of the big bang theory, which tells us that equal amounts of matter and antimatter were produced at the time of the beginning of universe. Now the question is “What happened to the antimatter?”. It is clear that a tiny imbalance between (matter) particles and antiparticles must have developed early in the evolution of universe, or it all would have annihilated, leaving behind only photons. The Belle experiment at the KEK B-factory in Tsukuba (about 50 km northeast of Tokyo) was built to study that phenomenon, called charge-parity (CP) violation, in the decays of B mesons, a class of subatomic particles containing a bottom quark, that are copiously produced in electron-positron collisions. Along with the BABAR experiment at SLAC in California, USA, Belle provided the unambiguous experimental confirmation of the mechanism for CP violation in the standard model of particle physics, which led to the 2008 Nobel Prize in physics to Kobayashi and Maskawa for their theoretical proposal. However, the CP violation content of the standard model falls short by several orders of magnitude to account for the observed preponderance of matter over antimatter. 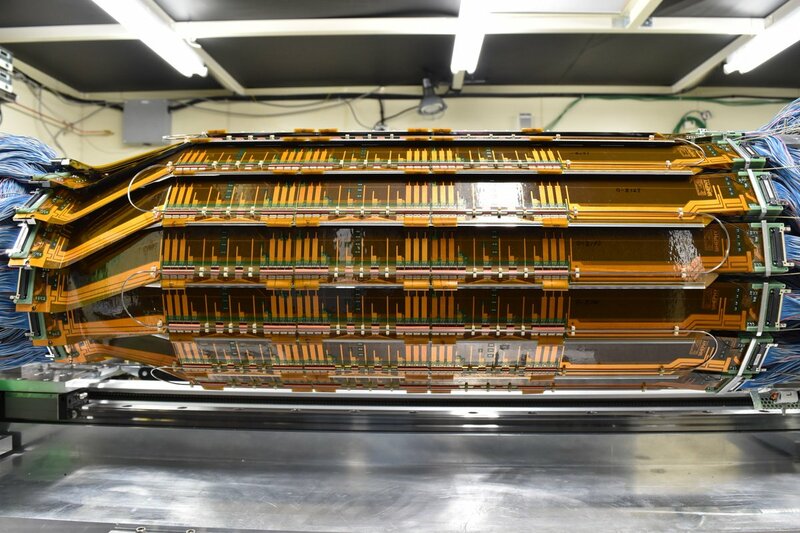 The Belle II experiment at SuperKEKB, an extensive upgrade of Belle, will search for new sources of CP violation and seek evidence for the ‘holy grail’ of new physics by studying rare decays of B and D mesons and tau leptons. With a data sample of about 100 billion B-meson decays (and a similar number of D and tau decays) in its armory, this experiment has potential to surpass the sensitivities of direct searches by the CMS and ATLAS experiments at the LHC. Photo of a layer-4 module of the Belle II SVD. The TIFR group has been a key partner in the experimental program at KEK since 1998. During the Belle era, with a record amount of data corresponding to one inverse attobarn (or a thousand inverse femtobarns), the group was heavily invested in the harvesting of this unique dataset and led a number of physics publications with first authors from TIFR. At Belle II, the group led the design, prototyping and construction of layer 4 of the silicon strip-based vertex detector (SVD). Passing through several stages of a rigorous international review, the TIFR Belle II group produced 12 high quality SVD modules; ten of them are now installed and ready for the physics run of Belle II while the remaining two are kept as spares. Similarly, the group hosts a Belle II grid computing site and is preparing itself for the physics harvest of the experiment. Both Ph.D. and M.Sc. students are strongly encouraged to get in touch with Prof. Gagan Mohanty in order to explore various interesting topics for their theses and projects.